There are few things in life as sad as watching a former 007 being reduced to selling pan masala. Twitter believes it's because he still thinks he has the license to kill. We're going to laugh at that once we're done sobbing in embarrassment on Brosnan's behalf. The face many '90s kids associate with Britain's most suave spy will now be selling Pan Bahar, and Indians across the country got their first taste of the sort of adverts we should now expect. Still in the get-up from his upcoming film Urge - with salt-n-pepper hair and beard and dressed in a dapper suit, Pierce stands tall. With pan masala in his hands. Class never goes out of style says the tagline, because irony. Billboards, newspaper front pages and a YouTube ad - Pan Bahar has gone all out to showcase the new face of the brand. And likewise, so has Twitter. Bond, with a side of pan masala anyone? Pierce Brosnan in PANtum of Solace.. Always had a feeling Pierce Brosnan was pansexual. 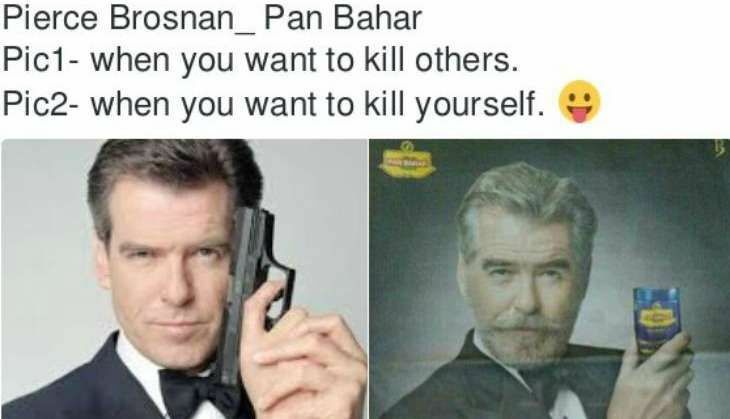 Pierce Brosnan is endorsing pan bahar , i think that dude doesn't even know what is in that box. He think its m&m's.